Much of the information that was once only available to professional researchers from expensive, fee-based sources is now available for free on the Internet, if you know how to find it. There’s more to conducting a comprehensive search for information on the Internet than just relying on the results returned by search engines, though. 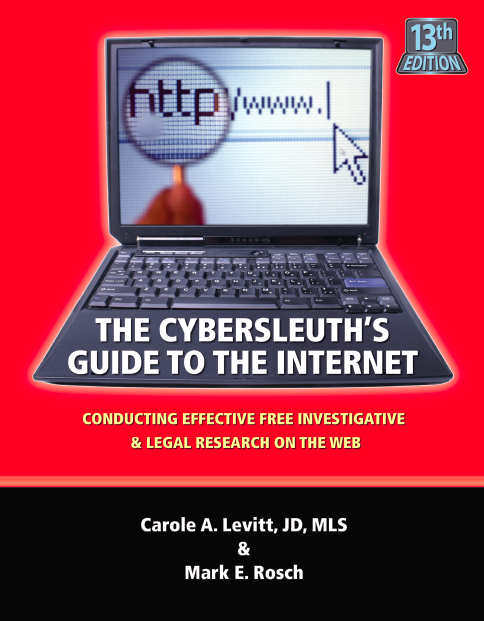 The Cybersleuth’s Guide to the Internet: Conducting Effective Free Investigative & Legal Research on the Web will show you how to be your own cyber-detective and unearth this information FREE (or at low cost!) on the Web. Availability: A limited number of copies are still available for immediate shipping. More copies are being printed and will ship within 1-2 weeks. What people said about "The Cybersleuth's Guide to the Internet:Conducting Effective Free Investigative & Legal Research on the Web" 12th Edition? Recently I had the privilege of spending the day learning about Carole Levitt and Mark Rosch's latest book, the 12th edition of The Cybersleuth's Guide To The Internet. The very fact that this book is now in its 12th edition tells you how incredibly popular it has been over the years. I consider the authors to be the gold standard among experts who write and teach on Internet research for lawyers. . . . As an Advanced Legal Research professor I use all the Levitt and Rosch books in my course. However, if you want the best of all worlds I recommend you start with this new 12th edition of The Cybersleuth's Guide To The Internet. It includes a lot of the best sources and information from their other more detailed books. The Cybersleuth's Guide focuses on free and low cost resources such as the search engines Google, Bing, Yahoo, Justia and USA.gov. There is an entire chapter on Google which is a great place to learn about Google's advanced search features. For example, they cover using Google to locate current news as well as using Google archives to locate historical information. One of the best parts of this chapter is information they provide on hidden features in Google such as the glossary and using synonyms. It's hard to believe that the 12th edition of The Cybersleuth's Guide to the Internet is out! My friends and colleagues Carole Levitt and Mark Rosch have done an outstanding job of updating this invaluable resource. You will constantly find yourself saying, 'I didn't know that was possible--how cool!' . . . If you want to be a cybersleuth, all the latest and greatest tools are here for you. You'll find that you want to keep this book near at hand in case you need to find something or someone and don't know how to go about it. While I have a corporate library, this book stays in my office bookcase. The all new expanded 13th edition of the Cybersleuth's Guide includes expanded reviews of the most effective methods for searching and retrieving information from the most popular social networking sites. It also includes extensive recommendations for free public records, investigative and people finder resources available for free on the Internet, as well as low-cost pay services, such as TLOxp, OPENOnline.com, and Search System's Premium searches. For those of you who own prior editions of The Cybersleuth’s Guide to the Internet, you will notice that this new edition no longer contains legal research topics that were unrelated to investigative research (e.g., statutes, ordinances, etc.). We have retained information about case law databases (but only free ones) and dockets (free and low cost) as part of the discussion of how these sites can be used for investigative and background research. The content from those deleted chapters became the basis for a new Internet legal research book, Internet Legal Research on a Budget (American Bar Association Law Practice Division, 2014). Even if you're not exactly certain what site you're looking for, finding a site you need is easier than ever with this edition's updated and expanded index. Whether you're looking by jurisdiction, type of information (e.g. real estate records), or by web site name, you will find it quickly in the guide's comprehensive index which includes more than 2000 entries. Levitt is a lawyer, law librarian and legal educator – she is not a computer technician. This guide is based on her more than 30 years in the legal field and is written the way legal professionals actually search for information. Levitt is active in Bar activities at the state and national level, currently serving on the Publishing Board of the American Bar Association's Law Practice Division (LPD) and the ABA's Committee on Model MCLE Rules. Previously, she served on the LPD's Executive Council and Ethics Committee, as well as serving as Chair and a member of the Executive Committee of the California State Bar Law Practice Management & Technology Section. She has also been a regular contributor to the "Computer Counselor" column for the Los Angeles Lawyer magazine. Rosch is a frequent speaker on the topics of Internet research and using technology more effectively in the practice of law. He has also written on computer-related topics for numerous publications including Legal Productivity, GP Solo, Law Office Computing, Law Practice, Small Firm Business, FindLaw and LLRX.com among many others, and was also a regular contributor to Los Angeles Lawyer magazine's "Computer Counselor" column. He is active in the ABA's Law Practice Division and currently serves on its TECHSHOW Planning Board. Together, Levitt & Rosch are also the authors of Google for Lawyers: Essential Search Tips and Productivity Tools (2010), Find Info Like a Pro, Volume 1: Mining the Internet's Publicly Available Resources for Investigative Research (2010), Find Info Like a Pro, Volume 2: Mining the Internet's Public Records for Investigative Research (2011), and The Lawyer's Guide to Fact Finding on the Internet (3rd Ed. ; 2006) - all published by the American Bar Association. Separately, Levitt co-authored Internet Legal Research on a Budget (with Judy K. Davis; 2014). Levit & Rosch have conducted hundreds of in-person MCLE programs for numerous Bar associations, law firms, corporations and other professional organizations since 1999. In 2014, both were inducted as Fellows of the College of Law Practice Management - an honor society created to "recognize distinguished law practice management professionals." In 2013, both were named to the Fastcase 50, recognizing "50 of the smartest, most courageous innovators, techies, visionaries, and leaders in the law." Thousands of copies of the book's eleven previous editions are helping legal professionals all over the country save time and money as they conduct legal and investigative research. This guide has also been added to numerous county, academic and corporate libraries. Add this book to your collection and put the authors' years of research and training experience to work for you.